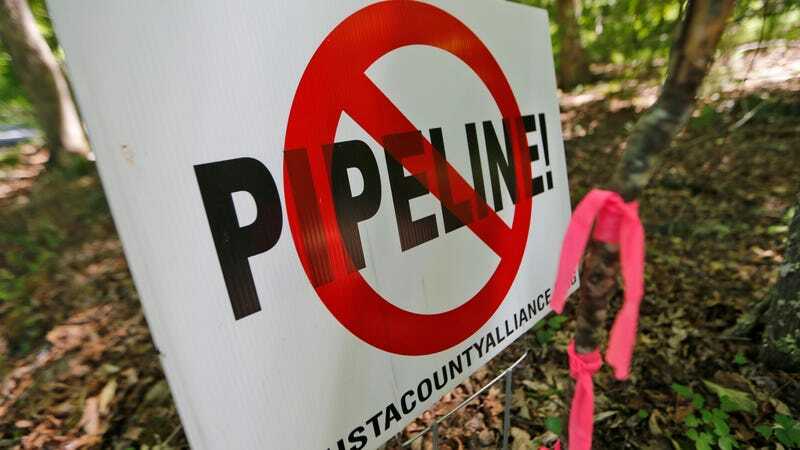 The Federal Energy Regulatory Commission approved the Atlantic Coast pipeline on Friday. The natural gas project has largely flown under the radar, but it’s one hell of a pipeline: 600 miles long and set to run through three states. Activists have been busy on the ground challenging it since at least 2013—and not far from Warren County, where the term “environmental justice” was first born. One out of the three commissioners voted against the gas pipeline: Cheryl LaFleur. She is also the only pre-Trump commissioner. In her dissenting opinion, Cheryl wrote that the pipeline was not in the public interest, citing its significant environmental impacts. The commission also approved the Mountain Valley Pipeline Project, a 300-mile long natural gas pipeline that follows a similar route as the Atlantic Coast pipeline. Cheryl wrote that she would have preferred to see these two projects merged. With this FERC stamp of approval, pipeline developers can begin the process of acquiring necessary land or property. That means, if a landowner refuses to compromise with the energy companies, they can invoke the use of eminent domain—a concern landowners and pipeline opponents had before this certification. The Atlantic Coast pipeline is a $5 billion project from Dominion Energy, one of the largest energy producers and transporters in the country. Dominion owns most of the project, but Duke Energy, Piedmont Natural Gas, and Southern Company Gas are co-owners. The pipeline would run approximately 600 miles through West Virginia, Virginia, and North Carolina. However, pipeline developers have alluded to an expansion through Lumbee Tribe territory and into South Carolina. The fracked gas set to run through the pipeline would come from the Marcellus and Utica Shale Formations in West Virginia. The pipeline was the only pipeline President Donald Trump included in his Emergency & National Security Projects priority list back when he was running for office. Since his election, he hasn’t mentioned the pipeline. Other projects—like the Dakota Access and Keystone XL pipelines—appear to have taken priority. More than half of the Atlantic Coast would be made up of a mainline pipe built 42 inches wide with most of the rest running 36 inches wide—both hefty sizes for a pipeline carrying natural gas. The wider the pipe, the larger the risk. Every pipeline has a “potential impact radius,” also called the blast zone or incineration zone. This looks at potential explosions and maps out vulnerable areas. Dominion has severely underestimated the blast zone for the pipeline, according to a report from local environmental group Clean Water for North Carolina. The group’s calculations resulted in a 43 percent greater potential impact radius than the 660-foot radius Dominion came up with. Local activists are also worried about leaks. Federal regulators were clear in the Final Environmental Impact Statement that the pipeline does pose some risk to nearby waterbodies, the endangered Indiana bat, and forested vegetation, among other resources. “Most, but not all of these impacts, would be reduced to less-than-significant levels,” the statement reads. FERC also concluded that any risks wouldn’t disproportionately impact “environmental justice populations,” defined as low-income or communities of color. To that, Executive Director of Clean Water for North Carolina Hope Taylor scoffs. Essentially, the environmental review compares the number of low-income and communities of color near the pipeline to how many make up the county, rather than the state. So if a county already has a high number of black residents, for example, and the pipeline runs through their community, they wouldn’t be considered an environmental justice community even if that county has more black residents than what is the average for North Carolina. Compressor stations are of special concern for Kelly Martin, the director of the Sierra Club’s Beyond Dirty Fuels Campaign. They regulate the gas’ pressure to ensure it can travel through the pipeline, but they spew sulfur dioxide and particulate matter into the air while doing so. These pollutants can trigger asthma attacks and increase respiratory issues. Despite this information, the Final Environmental Impact Statement concluded the pipeline didn’t impact low-income or communities of color any more than other communities. What have people already done? They’ve been protesting. Heavily. Back in March, activists walked the pipeline route in North Carolina for two weeks to help draw attention to their struggle. That’s right: People walked from the North Carolina-Virginia state line to Gettysburg, North Carolina. The Sierra Club has helped organize some kayaktivism throughout North Carolina, too. In August, they rode down the Tar River to raise awareness on how the pipeline would impact their waterways. They also worked with the Lumbee Tribe on a tribal-led paddle that 100 people attended. Groups from all fronts were busy submitting public comments to the Draft Environmental Impact Statement and, more recently, to the Final Environmental Impact Statement, which came out in July. Well, this FERC approval isn’t the last stage. The pipeline still needs state environmental permits for water crossings and the compressor stations. In September, the North Carolina Department of Environmental Quality requested more information before issuing the water quality certification permit, which Taylor says is the main permit of concern. Earlier this month, the state also denied a permit for erosion and sediment control. Until the state decides on these permits for good, organizations like the Sierra Club and Clean Water for North Carolina are ready to step up via litigation if they must. That’s what the Sierra Club did in June with the Mountain Valley pipeline. The group succeeded; the state rescinded the project’s water quality certification last month. “We will be using all tools including legally to ensure that our water, our air, our communities, and our climate are protected from proposed fracked gas pipelines,” Martin told Earther.